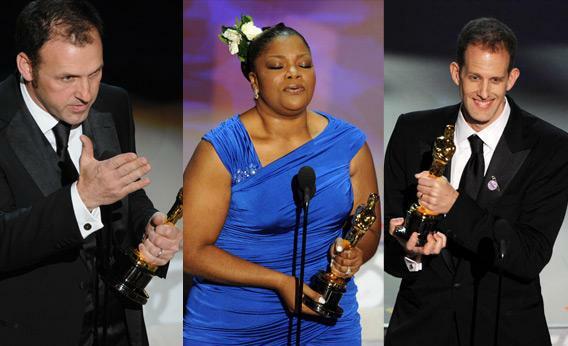 Oscars 2012 acceptance speeches: How to make them better. A modest proposal for rewarding great acceptance speeches. Photographs by Gabriel Bouys/AFP/Getty Images. During this Hive, we’re asking writers and editors from inside and outside Slate to present their ideas for improving the Oscars. Here’s a counterintuitive idea for keeping the ceremony lively: Don’t cut off long acceptance speeches. Let the winners talk as much as they want. Just one rule: They can thank only three people. I get why the producers feel they have to cut people off. Acceptance speeches have become little more than long lists of names that nobody outside the theater is remotely interested in hearing. If I want to know every single person who worked on the film, I’ll check IMDb. Punctuating those lists with a giggly and/or panicky “I know I’m forgetting someone” does not make them any more compelling. But on those occasions when the winners aren’t just thanking their agents and stylists–when they’re being actually clever or funny or endearing–ushering them offstage before they’re done (so you can get to the next person with a laundry list of names?) makes no sense. Plus, it’s just so mean. So there are currently two problems with acceptance speeches: 1) We watch all night to see our favorite actors and filmmakers and then they bore us with their tedious thank-yous; and 2) Our favorite actors and filmmakers (or even ones we’d never heard of before) are shaking things up with those nonboring, unvetted moments that Oscar memories are made of, and their microphones are turned off. Replacing the time limit with a name limit solves both these problems. (Yes, “the academy” counts as one name.) It encourages nominees to have something actually interesting prepared for the night, and if they don’t, they have nothing to do but wave and walk off. Got a great idea for improving the Oscars? Submit your idea to the Hive!